All Night Nippon Super Mario Bros. is a game for the Famicom Disk System that was distributed to winners of a raffle. Hosts and entertainment personalities related to the Japanese radio show All Night Nippon were put into the game, replacing enemies and allies. The other graphics were taken mostly from the Japanese Super Mario Bros. 2. 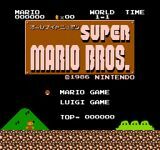 The levels were taken from the original Super Mario Bros., Super Mario Bros. 2, and Vs. Super Mario Bros.
Because of its extremely limited release and relation to one of the most popular games of all time, All Night Nippon Super Mario Bros. is among the rarest and most sought after games for the Famicom Disk System.